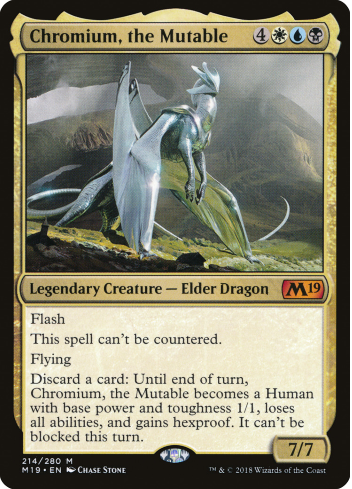 Jumbo cards did appear with 8Th Edition, since then hundreds of them exist from different Editions or Extensions and with different measurements and different versions of MTG backs. They are used or given at different MTG events. Preview/Show play cards. Those are by far the biggest and are around 36" X 48". Some oversized cards from Duel Decks: Elves vs. Goblins were used at a special event during World Championships 2007 in New York City, USA. They measure approximately 24" x 17". Some oversized cards were used at the Massive Magic Tournament hosted by people from Robot Chicken and held at Pro Tour San Diego (19–21 February 2010). Two decks of oversized cards were brought by Magic: The Gathering R&D team. Starting with Grand Prix Baltimore and Milan 2015, each Grand Prix in 2015 will be featuring prize wall oversized cards. 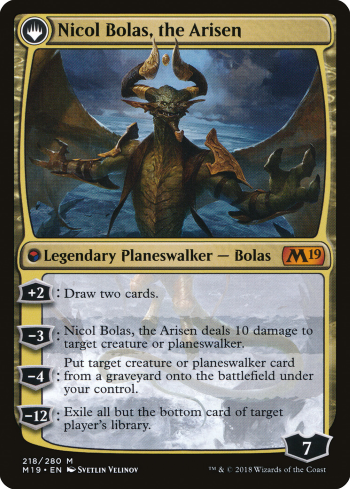 They measure approximately 26 x 36,315" looking like foam board version of cards, have a specific MTG back and they are available in different languages. Every Grand Prix in 2015, along with the GPs in Milan and Baltimore, will receive three oversized cards that will be used as prizes during a Grand Prix weekend. Every Grand Prix will feature an oversized version of the Griselbrand participation promo (you remember that this promo is new starting with this weekend, right? ), and the other two oversized promos will be a popular card in the current set, matching the event's playmat where appropriate. This weekend features Sagu Mauler and Villainous Wealth alongside Griselbrand as the oversized cards available as prizes in Baltimore and Milan. 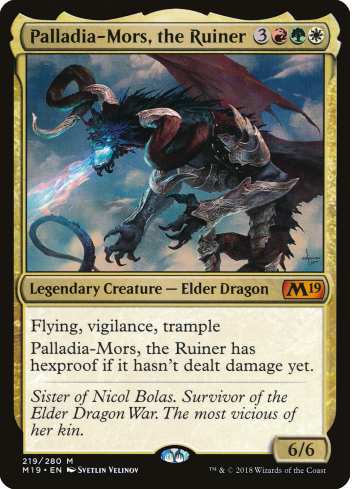 So Griselbrand is limited to one per GP in the year, so 54 total. It was available on the Prize Wall on site in GP Baltimore for 1500 tickets. 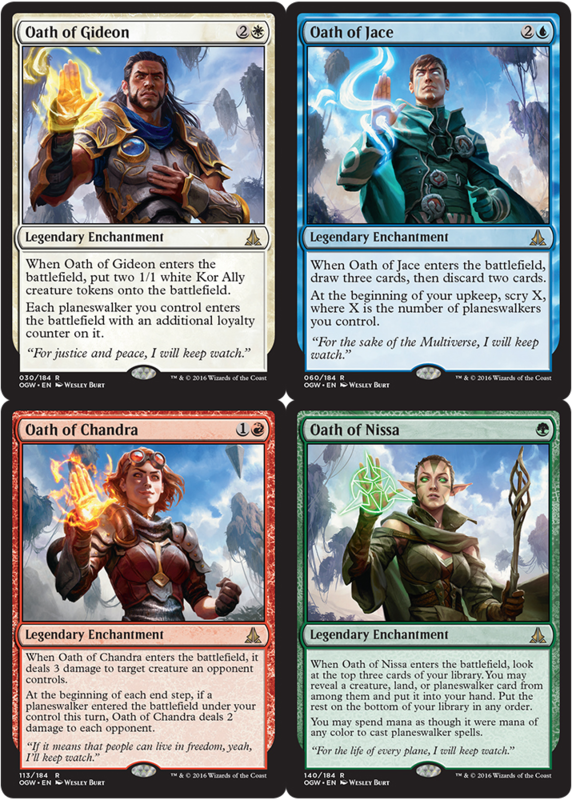 From February 11 and March 6, 2016 any WPN retailer (in North America and Europe) that runs at least three 2HG events will receive a set of oversized (19.5" x 26.5") cards from Oath of the Gatewatch: Oath of Gideon, Oath of Jace, Oath of Chandra, and Oath of Nissa for their store. Massive Magic is making a special return for Grand Prix Las Vegas on June 16, 2017 at the Las Vegas Convention Center, we'll be hosting a very special Massive Magic game for fans to participate in and enjoy in the evening. 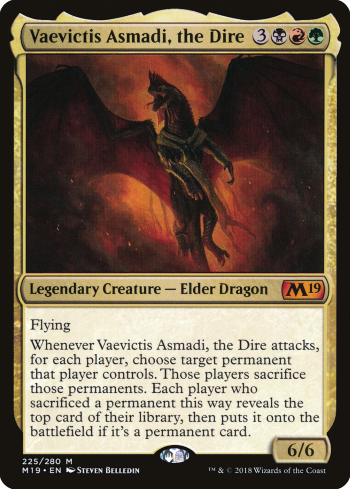 More importantly, it'll mark the beginning of Hour of Devastation previews, meaning GP Vegas attendees will get to see several Hour of Devastation cards for the very first time—and in oversized form. 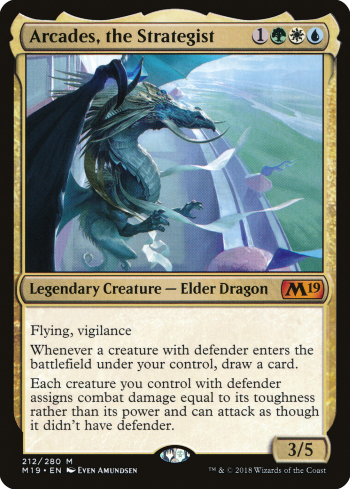 An exclusive WPN APAC promotion took place in July 2019, the reward was a full set of 5 Core Set 2019 Legendary Elder Dragons. Those could be obtain by running and reporting 10 sanctioned tournament either for draft or sealed. They measure approximately 330 x 460 millimeters (12.9921' x 12.9921'). 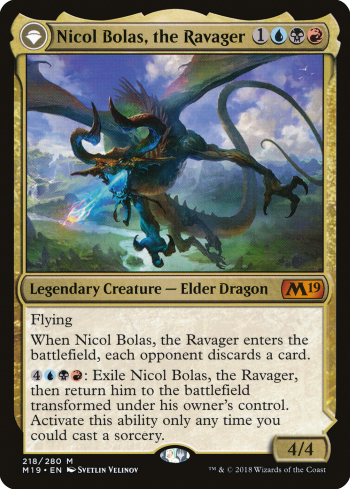 They have specific MTG back except the double-sided Nicol Bolas. WPN APAC Promotion announcement (that was sent by e-mail).